Situated in the heart of Bangkok within easy access to all the main shopping and entertainment areas, experience world-class service and facilities in the “Land of a Thousand Smiles“. With elegant décor and Thai-inspired accents, our 61 floor high vertical resort welcomes you with unparallelled views of the vibrant city and the legendary River of Kings, the Chao Phraya River. Relax in our exquisitely appointed Bangkok 5 star hotel suites, enjoy exclusive privileges at the largest Club and Dinner Lounge in town, indulge yourself in the multiple-award winning luxury spa in Bangkok or savour the mouth-watering culinary delights of our fine-dining establishments offering a variety of ethnic cuisines. 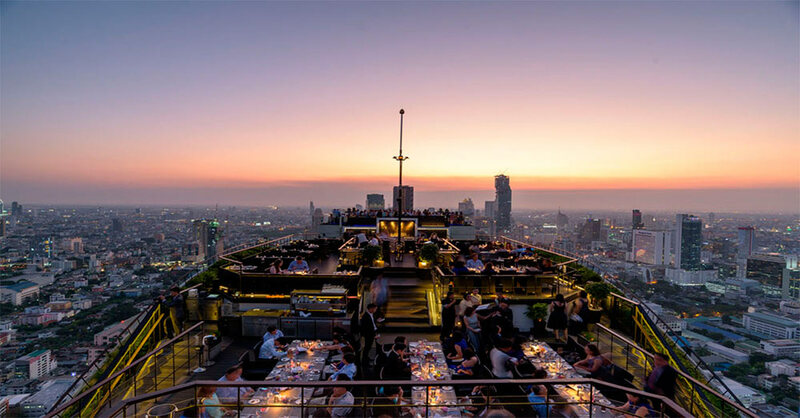 Sample evening cocktails at our breathtaking al fresco rooftop restaurant and bar, Vertigo & Moon Bar, experience authentic Thai fare at our signature Thai restaurant Saffron, or treat yourself to a truly unique dining and cultural experience aboard Apsara Dinner Cruise.